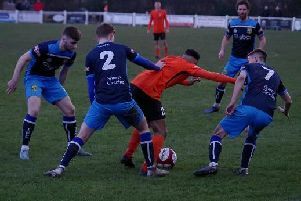 Just as they did last season, Glossop North End knocked Tadcaster Albion out of the FA Trophy at the preliminary round stage. An own goal and a late rocket of a shot proved enough to earn the visitors a 2-0 success at the i2i Stadium, almost a year to the day since they beat the Brewers at the same stage of the competition by the same scoreline. Boss Michael Morton made just a single change to the starting XI that were unlucky to only draw at Droylsden last week as Laurence Hunter came in at left-back for his debut. And Albion, looking for their first ever win in the competition, almost got off to a perfect start inside 30 seconds as Tom Corner set Aiden Savory away down the right-hand side and he was extremely close to picking out an unmarked Conor Sellars. The fast start continued and there were only three minutes on the clock when joint-top-scorer Savory got his first chance of the afternoon. A huge goal kick from Greg Hartley was misjudged by a North End defender and nodded backwards setting Savory in behind, but the frontman lashed off target. It was then the Hillmen who opened the scoring in the sixth minute, but through a Taddy player. A corner found it’s way back out to Chris Baguley on the right wing and his dangerous delivery across the face of goal was flicked on and then unfortunately turned into his own net by Josh Barrett from close range. The Brewers almost responded immediately, but were denied an equaliser by the woodwork. Josh Greening’s in-swinging free-kick was headed against the frame of the goal by Savory and Andy Milne couldn’t turn in the rebound. Following their goal, the visitors seemed to click quickly into gear and they enjoyed decent 15-minute spell in the ascendency without ever really carving out a clear-cut chance. Pete Davidson did have an opportunity for the hosts at the other end when a Greening corner dropped to him, but he blasted high and wide. Albion started the second half like they did the first as Greening’s deep right-footed cross was met by Corner at the back post, but the striker couldn’t generate enough power on the header to beat Russell Saunders in the away goal. Taddy were in charge as the game passed the hour-mark and Saunders was tested again following a lovely passing move. Hunter won an initial header and Sellars squared the ball across to Greening who picked out Savory, but his powerful strike was well saved. With the home side doing all the pressing, they went close again just two minutes later. Saunders punched a corner kick high into the air and Corner climbed highest to nod the ball towards Milne, but the Taddy skipper was beaten to it by a defender, just at the vital moment of pulling the trigger. With gloveman Hartley untroubled, Morton’s men started to up the tempo with 15 minutes to go. Corner and debutant Hunter both saw efforts well blocked before Greening performed several step-overs, cut inside and saw a strike held by Saunders once more. But Glossop rode their luck, defended well when required and then sealed the win eight minutes from time. After a mini game of head-tennis, Baguley got the ball down and rifled a low shot in off the post from 24 yards out, ending any Albion hopes of a comeback.